Frequently Asked Questions on Admissions and the Application Process. The following is a list of frequently asked questions about how to apply to IST Austria. For general information on the PhD admissions process, please refer to the PhD admissions page. For general questions on the PhD program, see also the PhD program FAQ. If you want to do a PhD program at IST Austria, you need to have a bachelor’s or a master’s degree in science. You will be asked to submit proof of your previous degree(s) when you apply. You also need to be proficient in English oral and written communication. 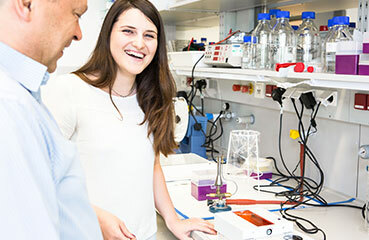 The PhD program at IST Austria, also known as the ISTScholar program, is partially funded by the European Union’s Horizon 2020 research and innovation programme (grant agreement no. 665385). Top-ranked students who fulfill the mobility criteria will also be Marie Skłodowska-Curie Fellows. For more information about our PhD program, click here. What is the mobility criterion? The mobility criterion is only relevant for deciding whether you get awarded the “Marie Skłodowska-Curie Fellow” title in addition or not. It is NOT an eligibility requirement for the PhD program. In other words, this has no impact on the amount of funding you receive and if you do no meet the mobility criterion (but meet all other PhD eligibility criteria) then you are still eligible to apply for our PhD program. To meet the mobility criterion, a candidate should not have resided in Austria for more than 12 months within the past three calendar years prior to application. In other words, a candidate submitting their application for the January 8, 2019 deadline should not have resided in Austria for more than 12 months between January 8, 2016 and January 8, 2019. Please also read the FAQ below: “Can I apply if I do not fulfill the mobility criterion?”. Can I still apply if I do not fulfill the mobility criterion? Yes, absolutely. We review all incoming applications and select our students regardless of whether they fulfill the mobility criterion or not. If your application is successful, AND if you are among the top-ranked candidates who fulfill the mobility criterion in addition, you will obtain the title of “Marie Skłodowska-Curie Fellow” in addition. What subject areas can I do a PhD in? The subject areas which you can do a PhD in is closely related to the research topics which our faculty members specialize in. A good starting point would be to browse through the scientific research topics being conducted at IST Austria, and see which area suits your background and interests best, as well as whether you have the relevant experience. Yes, IST Austria does not have any quota on international students. I have not yet completed my studies yet, can I already apply? Yes you can. However you must finish your stated course of study before the start of the PhD program in Austria (September 15 in the same year of application) and must be able to demonstrate that you have completed your first degree in August before the program starts at the very latest. Is there funding for the PhD? There is also financial support for students to cover travel expenses for attending scientific conferences and workshops. See our funding page for more information. IST Austria does not charge any tuition fees. How long is the PhD program? The PhD program is typically 4 to 5 years in length, depending on whether the student has been admitted with a bachelor’s or master’s degree, as well as on the student’s individual progress. What is the age limit for PhD admissions? IST Austria does not have any age limit. Does IST Austria offer bachelor's or master's degree programs? No we do not. You may be able to perform research for your bachelor’s and/or master’s thesis as a scientific intern in one of the research groups. Please check the page “BS/MS Thesis” for more information. Can I start my PhD earlier than September? The annual start date for the PhD program is September 15. This means it is not possible to start your PhD earlier than September. However, some students choose to do a research internship with a group of their choice before this date. For more information, have a look at the internship possibilities we offer. No. English is the language used for communication in the Institute. On the other hand, being able to speak German makes a lot of things in daily live much easier in Austria. For this reason, IST Austria provides free German courses for students enrolled in the PhD program. If you are not from an EU/EEA country or Switzerland, you will need to apply for a visa in order to legally take up employment and register as a PhD student at IST Austria. When you get an offer from IST Austria, you will be sent information on how to apply for your visa from abroad. IST Austria is located just outside of Vienna. It is a short 25-minute bus ride from Heiligenstadt (U4). See this page for directions to the institute. Vienna is consistently voted one of the best cities in the world to live in, and students have the choice of living in Klosterneuburg, a quiet area with beautiful woods and close to the world-famous monastery (Stift Klosterneuburg), or right in the hustle and bustle of Vienna. I was not accepted the last time, can I apply again? Yes you can, however you will need to create a new application, submit all required documents and request letters of recommendation again. Housing is available on IST campus, and international students are prioritized if they choose to live on campus. There is a guest house with 38 guesthouse rooms (24 single rooms, 6 single rooms equipped to be suitable for persons with disabilities, 4 double rooms, 4 junior suites), for short stays of up to 3 months. For long stays of between 4 and 12 months, there are 31 apartments (between 33m² and 90m²) available, with plans already in place to expand the number of apartments in the future. A room or apartment can be rented for a period of up to one year after arrival, giving incoming international students time to find suitable accommodation for the subsequent years. Note that housing on campus is subject to availability. What is student life like at IST Austria? Our PhD students are an integral part of the scientific community, and apart from scientific research activities, they are also actively involved in various sports and other leisure activities. There is the annual IST Institute Retreat, which scientists and staff of the whole Institute are invited to attend, and at which students are a significant presence. Some of our students also live on campus, and are actively involved in all the activities that the Institute has to offer. Have a look at Campus Life, to get a sense of what life on campus is like at IST Austria. Where do IST Austria students come from? At the moment, we have scientists from over 50 different countries and a very diverse and international student population. About a quarter of our students are Austrian. IST Austria is committed to promoting diversity and equality, and we encourage applicants from all over the world to apply to the PhD program at IST Austria. How do I find out more about IST Austria? The best way is to browse our website, the most up-to-date source for events and institute-related announcements. “Like” our Facebook page, to stay in the loop about IST Austria and the whereabouts of our scientists! We also have a quarterly newsletter, which is a summary of the highlights of our institute, in a compact quarterly format. You can also choose to have it delivered straight into your (virtual) mailbox, by filling out this form. Or, better even, visit us during the Student Open Day, or Open Campus Day, to experience first-hand IST Austria’s excellent infrastructure, warm sense of community and the excitement we all share for science! If you have any questions about our PhD program, feel free to contact the Graduate School Office team. We would be more than happy to tell you about our PhD program. The selection committee will start its review process after January 15. The first review process will be completed in early February. Candidates will be notified about their status by mid-February. Short-listed candidates will be invited on-site for interviews in mid-March (2019: March 14 and 15). Offer letters will go out in late March and candidates have to accept or decline by April 15. The start of the PhD program is uniformly on September 15. You can make changes as long as you have not submitted your application. After you have submitted your application, you will need to contact us detailing which changes should be made and/or which documents should be updated. Please note that this can only be done up to the submission deadline (January 8)! Can I submit materials after the deadline? No, we will not accept supporting materials received after the deadline (January 8). The deadline is firm and extensions are not granted. Can I have an extension for submitting my application? No, we do not grant any extensions. What is a "statement of purpose"? The statement of purpose (SoP) is an important part of your application that will tell the admissions committee who you are and explains why they should admit you. In your SoP you introduce yourself, your interests and motivations, summarize your undergraduate and previous graduate career, discuss the relevance of your recent and current activities, elaborate on your academic interests and what motivates you to apply to this particular program. You should also indicate what you would like to study in graduate school in enough detail to convince the faculty that you understand the scope of research in their discipline, and are engaged with current research themes. Please specify up to three research groups at IST Austria that you find the most interesting. We do not have a fixed GPA requirement for applicants. However the GPA of successful candidates typically is in the top quartile of their field of study. What language should my transcripts/diplomas be in? We require all transcripts/diplomas to be submitted in their original language AND in English. Translations do not need to be notarized. If available, please use English translations issued by your university. Do I need notarized translations of my transcripts/diplomas? Translations do not need to be notarized. If available, please use English translations issued by your university. I get an error message on the Education page when entering my GPA/month of graduation, what should I do? The fields referring to the GPA and the month of graduation allow number entry only. Please make sure that you do not enter any letters or special characters in the fields that ask about the grading system used in your country (i.e. %, /, A, etc.). For the graduation month enter 5 for May etc. E.g., if you have a grade of 95%, this will be a 95, and the max. grade is 100. If you have a grading scheme of A-E, translate it into a 1-5 grading scale. How do I choose my referees? Choose 3 referees who have taught you or supervised your work and are therefore able to evaluate your academic and research performance. These can be professors, assistant professors, postdocs or equivalent positions. We will accept up to one letter from a non-academic work environment. When entering the names and e-mail addresses, make sure that the e-mail address is still valid and the spelling is correct! Can I request a recommendation letter before I submit my application? Yes, please make sure to click the *request recommendation now* button. The referee will receive an email including a unique link to the recommendation form and instructions to complete the recommendation electronically. Please note that as soon as a referee is added to an application, he or she will receive this email. You should only add referees when they are prepared to receive this email, and to submit a reference letter for your application. Contact your recommender to let them know to watch for the message to arrive. Can I upload a letter of recommendation myself? No, we do require that letters of recommendation are submitted by the referee themselves. Uploading a letter of recommendation by yourself will lead to an automatic disqualification and your application will no longer be considered. My referee has not received the e-mail link. What should I tell them? Once you have submitted your application, the e-mails to your referees are sent automatically. If you have not yet submitted your application, make sure that you have used the “request recommendation” button. The email could have been categorized as spam by the referee’s email provider. Please contact them directly and ask them to check in their spam or junk folder, review their email security settings, and approve requests from gradschool@ist.ac.at. If the e-mail is lost in the institutional firewall, you should ask your referee for an alternative e-mail address and contact us to correct it. Double check the spelling: you may have entered their email address incorrectly when you submitted your application. In this case, please contact us to correct it. Requests for changes received after the deadline for referees (January 15) will not be considered. My referee submitted a recommendation, but it is not marked “received” in my online application. Most likely, you have more than one application in the system and the referee received multiple requests to submit a letter of recommendation. If this is the case, you are probably checking one application while your referee responded to a different application. Please check for all applications you may have and verify the status of each recommendation. the name, e-mail address and institution of the new referee. Keep in mind that we can only answer requests during standard office hours (Mon – Fri, 9 AM – 5 PM CET). How do I check the status of my reference letters? Please log in to your account and go to the References tab. A “check” mark after the referee’s name will indicate that the letter has been sent. Do I need to submit a TOEFL/IELTS or GRE score? No you do not. However you can upload them in the section “Additional Documents”.